The aftermath of Mac Ads Cleaner app being installed on a Mac is all about annoying fake popups about adware detection, so remove this infection right away. The name of the Mac Ads Cleaner application seems to be self-explanatory. The average user would think it helps get rid of ad-serving infections and protect privacy – so far so good. Moreover, the program’s graphical user interface looks neat and professional enough to evoke trust. Unfortunately, all of these impressions don’t play into the hands of those who have this utility running on their machine. 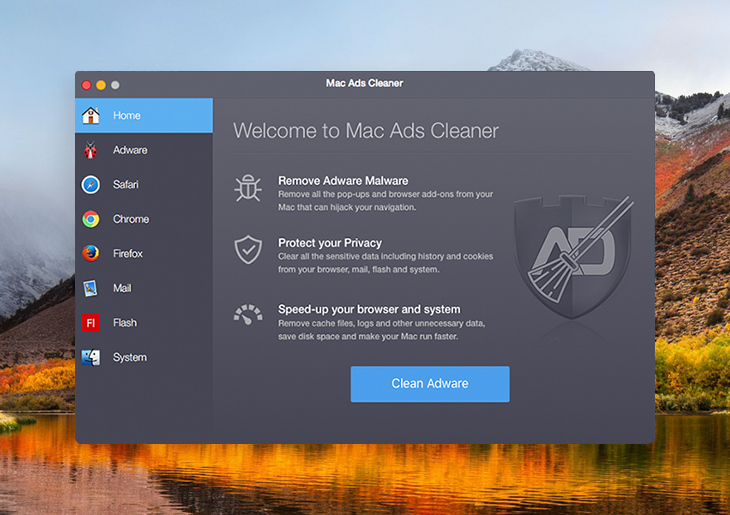 Mac Ads Cleaner is a well-camouflaged rogue product that only pursues the goal of duping victims into purchasing its license. It accompanies innocent-looking software available on web resources for Mac downloads. To add insult to injury, some of these sites are legit and popular, so people don’t exercise too much caution when going through the app setup process. The catch is that these installation wizards aren’t straightforward enough. By default, they promote extra items alongside the main program. It’s only by selecting the custom setup option that users can untick unwanted entities and thus prevent them from being installed. Some of the bundles reportedly involved in distributing the Mac Ads Cleaner virus include software like MPlayerX and 7zip unpacker. So it’s strongly recommended to read between the lines of the associated setup clients’ terms before clicking the Continue or Next button, otherwise security issues will be imminent. Technically, the perpetrating application thus gets the admin’s approval to get on board a Mac, but in fact the user won’t know how and when it appeared. When up and running, Mac Ads Cleaner will display a welcome window informing the victim that it is “standing sentinel” over their online activity. Simply closing this dialog won’t stop the program from manifesting itself, though. The adware will be constantly bombarding the plagued user with obnoxious prompts to clean adware. In addition, it will state that the web browsers installed on the system need cleaning. This applies to Internet cache, history, cookies and local storage, download history, and application cache. Be advised this is a scare tactic. Mac Ads Cleaner uses it to persuade the infected person into eliminating inexistent adware and privacy issues by registering its commercial copy. Obviously, an app as intrusive and deceptive as this one doesn’t belong on a healthy Mac. However, uninstalling it the usual way is to no avail – it will reappear over and over. That’s why it may be necessary to apply a specially crafted malware removal technique to get rid of Mac Ads Cleaner popups. 1. Download and install MacBooster application (read review). The tool provides both optimization and security features for your Mac. Before you get down to obliterating Mac Ads Cleaner virus proper, consider checking your machine for other security risks and performance issues by hitting the Scan button. 2. Proceed to the Uninstaller feature, find Mac Ads Cleaner on the Applications list and have MacBooster completely eliminate all components of the app from your Mac by clicking Uninstall in the bottom part of the GUI. Doing so will ensure all components of the malware and its remainders, which may have not been removed in the manual way, will be thoroughly cleaned up.